Last week’s Mountainwise blog profiled Matthew Lyvers, a father, nurse and Veteran who successfully utilized a local Diabetes Prevention Program (DPP) after learning he was at high risk for developing diabetes. While participating in the DPP he learned he could still eat delicious food while reaching his goal, regaining his health and losing over 100 pounds. Matt’s story included the fact that he had suffered from Post-Traumatic Stress Disorder (PTSD) as a result of his active military service. He reflected that his weight gain and resulting increased risk of developing diabetes was linked to having PTSD. Matt stated “I did not like the feeling of being hungry and would eat for no reason”. According to the VA, up to 20 % of the veterans who served in the “Iraqi Freedom” and “Enduring Freedom” operations have PTSD in a given year. If left untreated, all of those veterans are at an increased risk of developing physical diseases, and so is anyone else who has suffered psychological trauma. Studies show that the majority of the body’s systems are adversely affected by trauma. Specifically: “there is a significant disruption to gastrointestinal functioning, the cardiovascular system, immunological functioning, the reproductive system, the musculoskeletal system, neuroendocrine functioning, and finally [to] brain structure and functioning. Not only are these systems broadly affected by symptoms, but the risk factors for development of future medical disease are exponentially greater following exposure to trauma, as reported by Traumacenter.org. In other words, people who have experienced psychological trauma are more likely to develop diseases such as diabetes, heart disease, addiction, and auto-immune diseases such as cancer and asthma, to name a few. What sorts of events qualify as traumatic? Here are some examples of traumatic events: physical accidents (falls or accidents), natural disasters such as floods, fires and earthquakes, childhood surgery, abuse (including childhood abandonment by adults), combat, illness, birth trauma, certain medical procedures, school shootings and kidnapping. All of the above-mentioned incidents events can contribute to excessive stress on the body, which can trigger disease processes as Physician and writer Gabor Mate has reported: “Psychological influences make a decisive biological contribution to the onset of malignant disease through the interconnections linking the components of the body’s stress apparatus: the nerves, the hormonal glands, the immune system and the brain center where emotions are perceived and processed”. Psychological trauma has a particularly powerful effect on children’s brains and bodies and can contribute to systemic overload and negatively impact brain and body development. 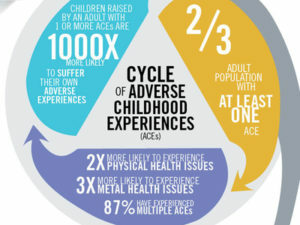 The ground-breaking ‘Adverse Childhood Experiences’ study strongly demonstrates an association between adverse childhood experiences (ACEs) (aka childhood trauma) with health problems across the lifespan. In addition to the incidents previously listed, the following events also fall into the category of adverse childhood experiences, as do the following: physical, sexual or emotional abuse, involvement with the foster care system, family addiction and neglect. Even in the absence of more obvious trauma, physical or emotional neglect often has a direct impact on brain circuit development in children, which then impacts the rest of the body. In fact, children who are separated from caregivers and denied physical contact and emotional connection will die in worst case scenarios. Less intense deprivation results in symptoms such as anxiety, depression, addiction, learning disabilities, and increased stress hormones in the body. The increased stress hormones can trigger disease processes in the entire body. Traumacenter.org suggests: “When a patient has multiple diagnoses or unexplained diagnoses, either acute or chronic trauma may have set the disease wheel in motion. Therefore, working to overcome the emotional impact of the trauma- either through trauma-focused interventions or through stress reduction may be a ‘first line of defense’ in chronic illness. This knowledge may empower clinicians to include ‘minimally invasive’ treatments such as mindfulness and yoga as their recommendations. Communicating the impact of stress on the body to patients in a detailed way may help patients place more value on stress reduction in their lives”. While it is true that traumatic events do become part of the brain (and body) blueprint, it is important to also remember that people are resilient – especially children. Brains can change; even adult brains can reformulate to an astonishing degree. To an encouraging extent it is not the trauma itself which causes damage, but what happens afterward. For example, if traumatized individuals resolve to not talk or think about it, they are more likely to develop physical symptoms. If they are pro-active about seeking help and find a way to process and transform trauma they can drastically reduce symptoms. Interventions which focus on the brain/body connection can be especially effective for treating trauma, such as trauma-focused yoga, EMDR, deep breathing, bioenergetics and other somatic therapies. Commonly utilized approaches such as Cognitive Behavioral Therapy can assist clients in gaining awareness of maladaptive thoughts and behavior patterns which frequently result from trauma, and can facilitate the healing process. Medications can provide relief for people and are ideal in conjunction with other therapies. It is helpful to maintain hope and remember that people can and have found tremendous relief from symptoms resulting from psychological trauma. In conclusion, it is worth remembering that there is direct link between psychological trauma and physical health. Gabor Mate writes: “Biologic and psychological activity are not independent; each represents the functioning of a super-system whose components can no longer be thought of as separate or autonomous mechanisms.” It is therefore also important to stay mindful of the brain/body link when preventing, treating and responding to psychological trauma.